Edgar Allan Poe was an American poet and short story writer. Best known for his tales of the macabre, Poe was one of the early American practitioners of the short story and of detective and crime fiction. He is also credited with contributing to the emergent science fiction genre. The Narrative of Arthur Gordon Pym of Nantucket is the only complete novel written by American writer Edgar Allan Poe. The work relates the tale of the young Arthur Gordon Pym who stows away aboard a whaling ship called Grampus. Various adventures and misadventures befall Pym including shipwreck, mutiny, and cannibalism before he is saved by the crew of the Jane Guy. Aboard this vessel, Pym and a sailor named Dirk Peters continue their adventures further south. Docking on land, they encounter hostile black-skinned natives before escaping back to the ocean. The novel ends abruptly as Pym and Peters continue towards the South Pole. This book collects some of the finest short stories, poems, and essays from the masterful American writer Edgar Allan Poe. FCIT. "Edgar Allan Poe author page." Lit2Go ETC. Web. 19 April 2019. <https://etc.usf.edu/lit2go/authors/68/edgar-allan-poe/>. 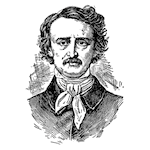 FCIT, "Edgar Allan Poe author page." Accessed April 19, 2019. https://etc.usf.edu/lit2go/authors/68/edgar-allan-poe/.